NBF Announces the Winner of the Beth Calabotta Sustainable Education Grant. JEFFERSON CITY, Mo. – The National Biodiesel Foundation awarded the first Beth Calabotta Sustainable Education Grant to Ph. D. student Mary Kate Mitchell. The $2,000 award is for Ms. Mitchell to participate in the Biodiesel Sustainability Workshop in St. Louis, MO on September 27, with the remaining funds applied toward academics. 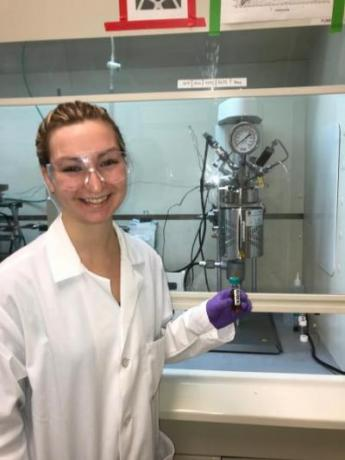 Ms. Mitchell is currently studying Chemical and Environmental Engineering at Yale University, presented at the 2018 National Biodiesel Conference, and is a member of the Next Generation Scientists for Biodiesel. Based on Beth’s work, the Foundation and the National Biodiesel Board want this grant to continue building on the idea that adopting innovative technologies and diversifying markets will produce environmental benefits that can be documented through research and data. The Foundation works closely with the National Biodiesel Board to address national issues affecting us all -- cleaner air, greater economic development for rural communities, and enhanced national security through energy independence. Organized in 1994, the mission of the Foundation is to accomplish outreach, education, research and demonstration activities for the advancement of biodiesel.